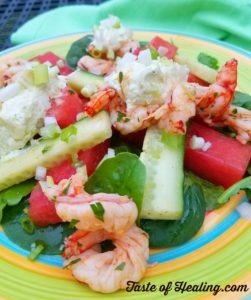 Late summer and the delicious sweet South Carolina watermelons inspired this cool summer composed salad. Marinating the watermelon and cucumber in a tangy dressing for a short time, creates a ‘quick pickle’ effect which draws out and intensifies the flavors. I paired with sweet, succulent Royal Red Shrimp harvested deep out in the Gulf by Veterans Seafood; shrimp which tastes a lot like lobster! I love using shrimp in dishes, however I am very wary of farmed shrimp treated with the preservative sodium bisulfite, not only does this leave an awful chemical taste, it is an allergen to many. The saltiness of feta is the perfect foil for the sweetness of the watermelon, in this recipe the feta is elevated to a new level by whipping the feta with olive oil, creating a sublime light fluffy finish to the dish. Trust me to mess with my own recipe! This cool late summer recipe is an update on my classic watermelon & feta recipe from last summer, created for a live cooking segment on the WCNC Charlotte Today Show. Plate as a composed salad for an upscale look perfect for entertaining, family style or individually. Marinating the watermelon in the chili lime vinaigrette draws out the flavors and provides the perfect balance between sweet, sour, salty & hot. 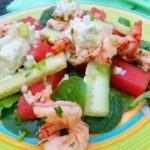 The saltiness of the whipped feta is a delectable touch to the dish with tender steamed shrimp in this cool summer salad. Whisk together all ingredients except for the oil. Add the oil in a slow steady stream while whisking, to emulsify. Taste, and adjust seasonings accordingly. The shrimp can be left whole, or cut in half up to 1/2 inch from the tail, this creates a corksrew effect as the shrimp steams. Add approximately 2 inches of water to a large pot fitted a steamer basket or mesh colander on the stove top and bring to a boil. Add the shrimp, place the lid on and lower the heat to a simmer. Allow to steam for 3 to 4 minutes, for whole shrimp, or 2 to 3 minutes for halved, be careful not to overcook. Remove the shrimp from the heat, place in a container and drizzle just enough dressing over to coat. Toss through and place in the refrigerator. Note: This part of the recipe may be prepared in advance, however do not marinate the shrimp longer than three hours as I can become mushy. Place the watermelon and cucumber in a large container or resealable bag. Add approximately ½ cup of the dressing, just enough to coat, and allow to marinade in the refrigerator for 30 minutes to one hour. Place the crumbled feta in a small bowl food processor or blender jug, with the motor running add the olive oil in a steady stream until the feta has a smooth whipped consistency. Assemble the salad: This can be plated family style or individually. In a large bowl, toss the power greens with the herbs and just enough dressing to coat, place on a large platter. Scatter the watermelon and cucumber over the greens. Add the juices from the marinate to the rest of the dressing. Using two spoons, place neat scoops of the whipped feta around the plate. Place the cooked shrimp on top of the feta scoops. Sprinkle with chopped green onion, serve immediately with extra dressing on the side. Coconut vinegar is the ‘new’ apple cider vinegar Made from coconut flower nectar, which is a nutrient rich sap. It has a nearly neutral pH, so not as acidic as most vinegar on the market, and has a much milder taste. Contains 17 amino acids, and important minerals such as potassium and magnesium and is great for gut health. You can find it in most health food stores, or online here. A mild white vinegar diluted with a little coconut water could be substituted.